I eat salads all year long but more so in the summer when temperatures are on the rise. Main course salads tend to be lighter meals that don't take that much effort to put together making them a wonderful hot weather meal option. To keep things interesting I'm always looking for new salad combinations; whether it be a cool new dressing or a fun ingredient to add. One thing I recently found was that Taylor Farms Organic has a lot of wonderful options when it comes to greens, so I don't have to having a boring iceberg salad if I don't want one. 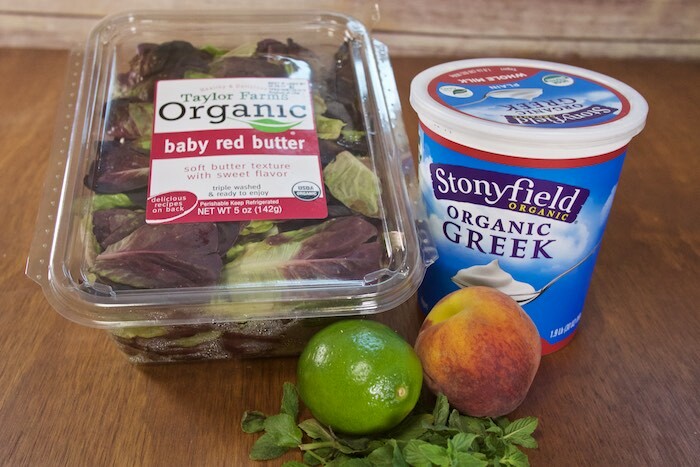 Stonyfield Greek Yogurt also plays a big part in spicing up my salads. I love coming up with new yogurt based dressings; not only are they super tasty but they are healthier than store bought. My latest combination was a delicious blend of Greek yogurt, lime and mint generously poured over a peach & baby red butter lettuce. 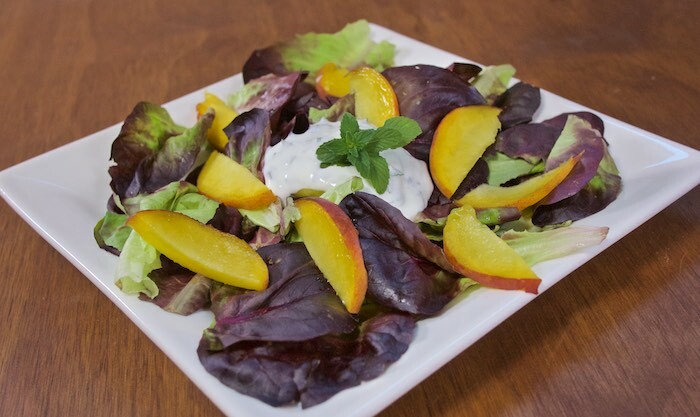 Toss lettuce with peach slices. Mix the remanding ingredients in a bowl and dollop on lettuce. Garnish with a mint leaf and serve. I have an ongoing relationship with Stonyfield.. I receive product, coupons or compensation for posts featuring their products. As always, all opinions are 100% my own. That salad looks like the perfect summer lunch! Love the peach and yogurt additions. Lovely salad! And the dressing sounds dreamy! This is so simple but so much flavor! I would love to add some spicy grilled shrimp! This salad sounds divine! LOVE the summer peaches and the lime mint dressing. Mint and lime is such a delicious combo with peaches, yum! Simple is so often better! Perfect lunch for summer! Love these flavors together! Perfect for this time of year!